Polex Environmental Engineering designs, supplies and installs dust collection systems, fume extraction systems as well as pollution control systems for industrial environments. Couray Fabrications recently used a Polex dust collector for an abrasive blasting project in Victoria. Couray designed and installed a comprehensive dust extraction system, which incorporated a Polex dust collector to capture and convey air contaminated with abrasive blasting dust through a network of heavy duty ductwork powered by a 15kW centrifugal extraction fan. 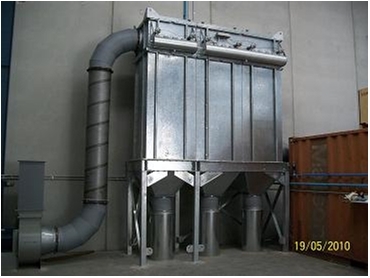 A reverse-pulse dust collector was selected for this application to allow for continuous blasting and to provide effective filtration of the fine dust being generated. A Polex 12-cartridge was used to extract 12,000 m³/h of the dust laden air, complete with 336m² of filter area. Each filter cartridge contains 28m² of cellulose polyester media, which is a tried and tested media used extensively throughout the abrasive blasting industry. The waste dust is collected in three cylindrical 185L dust collection bins located beneath the hoppers, mounted on pallets for easy removal and emptying. Polex’s modular dust collectors are fabricated from heavy duty 3mm thick folded and bolted sheetmetal panels. The panel design and configuration eliminates dust hang-up and potential blockages inside the dust collector. The unique modular design allows filter modules to be easily added if the additional filter area is required to process additional airflow. The support structure has been especially designed for heavy duty industrial environments. The legs are hot dip galvanised, making them suitable for indoor and outdoor locations. Polex manufactures a comprehensive range of dust collectors using cartridge filters or cylindrical bag filters. In addition to the range of reverse-pulse units, Polex also manufactures shaker-type dust collectors for intermittent dust extraction applications.